Lithograph of the forest of Mahassou in Kinnaur in Himachal Pradesh by L.H. de Rudder (1807-1881) after an original drawing by Prince Aleksandr Mikhailovich Saltuikov c.1842. 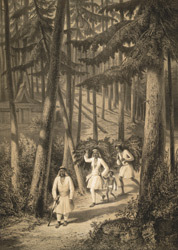 Prince Saltuikov started out on his voyage of the Himalayas from the popular hill-station of Shimla in September 1842. Kinnaur is situated near the valley of the Sutlej river and comprises the north-eastern part of the district between Pooh and Hangrang valley extending up to the modern border with Tibet.